The Clare Oliver Challenge, held between Monday 21st December 2009 to Sunday 31st January 2010, invited Australians to “Ban the Tan this summer”, urging sunbathers to keep their skin safe while raising funds through the Clare Oliver Melanoma Fund for urgently needed melanoma research at the Peter MacCallum Cancer Centre. 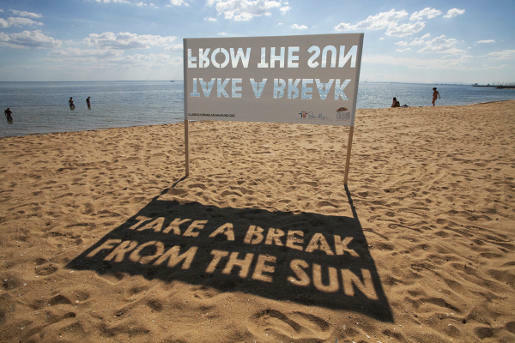 The campaign included an ambient display on the beach, using the sun to produce the message in shadow, “Take a Break from the Sun”. The Take a Break ad was developed at CHE, Melbourne, by executive creative director Jason Ross, deputy creative director Richard Ralphsmith, art director Josh Murrell, copywriter Sharon Condy, producers Connie Leone and Loreta Zaruski, account managers Meagan Bell and Ebony Moore. Clare Oliver died of skin cancer at the age of 26, after a three year battle against the disease. Having experienced herself the damage that solariums and sun exposure can do, Clare became aware of the dangers of tanning and used her remaining precious time and energy to make certain that the rest of Australia heard and responded to that message. Skin protection from the sun and from solarium rays is the message she shouted loud and clear – “No tan is worth dying for. Melanoma awareness is the legacy Clare wanted to leave behind. Throughout her campaign, Clare touched the hearts of the community, and governments are now focusing more on this serious health issue. Associate Professor Grant McArthur, a medical oncologist at Melbourne’s Peter MacCallum Cancer Centre, was Clare’s doctor and the first to praise her courage and determination. ‘Clare has taught us all about the importance of speaking out. Her voice will make a difference.’ And it has. SLIP on sun protective clothing that covers as much of my body as possible. SLOP on SPF 30+ broad spectrum water resistant sunscreen, liberally to dry skin, at least 20 minutes before sun exposure. Reapply every two hours when outdoors. Never use sunscreen to extend your time in the sun. SLAP on a broad brimmed hat that shades my face, neck and ears. 4. I will help raise funds for urgently needed melanoma research.